"Swiss chard cooked with garlic and balsamic vinegar. Quick and delicious!" Heat the olive oil on a large skillet over medium heat. Stir in the garlic and cook until tender and aromatic, about 2 minutes. Add the Swiss chard and balsamic vinegar; cook and stir until the chard is wilted and tender, about 5 minutes. Season with salt and pepper and serve. 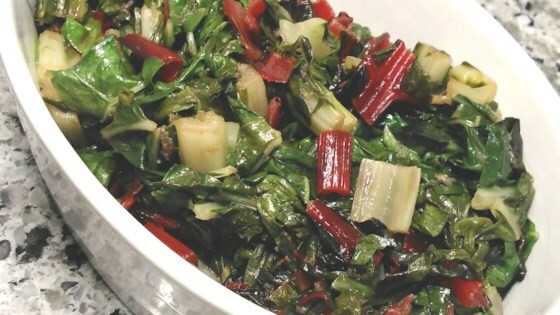 Healthy Swiss chard is sautéed with garlic and balsamic dressing. A neighbor gave us some Swiss Chard. We had never had it before so I looked up recipes. We made this one and loved it! It has a wonderful taste! Very tasty, be sure to use a good quality balsamic. I used the stems of the swiss chard, why waste them. I would make this again. This was great. I added less vinegar and cooked the stems first before adding the leaves.